About two months ago, I wrote an article detailing my progress in improving my gas mileage. By making a few small adjustments to my driving style, I was able to improve my mileage by 15%. 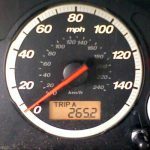 Today, I wanted to share a more general tip for saving money on gas: track your mileage mileage. If you’re at all competitive or motivated by numbers, then I can virtually guarantee you that your mileage will improve, and thus you’ll save money, if you simply keep track your mileage at every fill up. Not only does this make you more cognizant of your driving habits, but it helps make a game out of improving your gas mileage. The old school way of doing this is to simply keep a small notepad or ledger in the glove compartment and then record your miles driven and amount of gas purchased at each fill up. But guess what? If you have a web-enabled smartphone, it’s even easier. You can now track your mileage online using a web-based service. The two such services that I’ve heard the most about are FuelFrog and Fuelly. Both of these sites allow you to update your information on the go. FuelFrog relies on Twitter, whereas Fuelly has a mobile version of their website. After looking at the two, I’ve decided to create an account with Fuelly. To me, the mobile web interface is a more elegant solution than Twitter, and I also like that fact that I can easily compare my performance against that of other users. Thanks for the money saving tip. A firend just turned me on to driving under 2 1/2 MPR’s at all times. It makes driving less stressful and puts a few extra dollars back in my wallet whenever I fill up. Tracking IS always key. Since paying attention to gas mileage I was able to increase it by 3mpg just by laying off the pedal a little. Another great thing to do is keep your car in good working order. Fill your tires, clean the air filter and remove excess weight you may be carrying in the trunk(not your tire, leave that in). I am a number cruncher but I don’t crunch my gas mileage. My wife and I bike as much as possible to save on gas. I found FuelFrog first, and it is supposed to get comparisons to others similar to fuelly but doesn’t yet. RIght now, I’m recording in both, but I don’t do it mobile, I wait ’til I record the expense in my accounting program. Averaging about 42-43 mpg right now. Fuelly looks interesting. It would be nice if the portable GPS units had an interface that would allow you to enter gas usage data so that it could track mileage not only overall but on individual trips and trip legs. i started doing this last year (maybe even before that?) and am pleased with the improvement in gas mileage i’ve been able to accomplish. My driving habits have definitely come back down to earth and I am happy with the fact that my old Saturn now can get around 35-38mpg on average for every tank I fill up. This is a great piece of advice and I would recommend this to all drivers. I find tracking anything is key to success.